McCarthy’s Removals have been helping families to move home in the Leeds area for 50 years. Whether you’re moving house or flat, our Leeds based removals team are here to help. From our move coordinators in our Leeds office to the removal crew on your move day, as a BAR verified removal company, our team has gone through the necessary training and developed the right expertise to ensure that your removal runs as smoothly as possible. 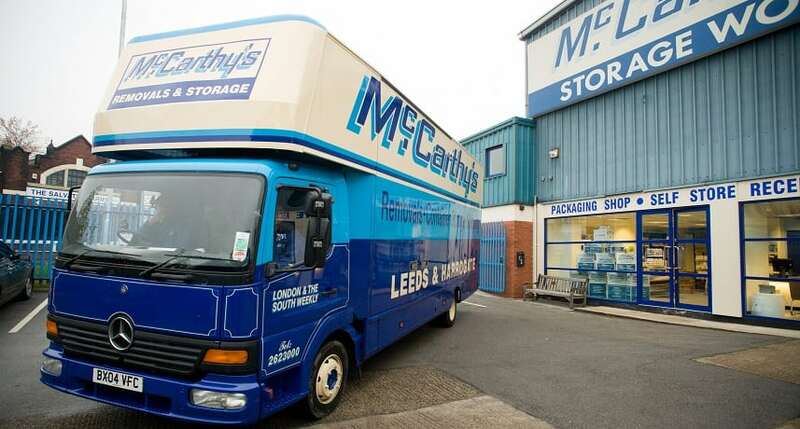 For 50 years, McCarthy’s have been running removals to, from and across the city of Leeds. In that time we have put together a dependable and experienced team that you can trust whatever your removal entails. We not only operate a home removal service, but we can also provide storage for your furniture, ornaments and other items which you might not have space for in the interim. Our container removal service makes the whole process simple as we load everything into a container and put the container into storage; providing peace of mind that your possessions are in safe hands. Moving home does not have to be the stressful experience that it is often made out to be. Our aim is to provide a dependable, efficient and professional removal service so that each move that we run is as stress-free as possible. But don’t just take our word for it. Our loyal customers give us a five star satisfaction rate using independent review platform Feefo. Take a look at some of our service reviews by clicking the widget below. No matter where you’re moving from or to, in or out of Leeds City Centre or even somewhere further afield, we will work with you to find the right solution. Removals and house moves from Leeds to London and back are just as common as moving house across Leeds postcodes such as LS6. At our removals office on Education Road, we also have services for container storage, self-storage, document management & confidential shredding. Piano’s, bookcases and delicate items often provide a source of concern when moving house in Leeds. These items are precious, valuable and delicate. The home removals team at McCarthy’s however have a wealth of experience in handling a range of items including piano’s, paintings and other delicate objects.